From left, council members Richard Simpson, Chad Hollon and Reilly Hopkins insist on having a discussion on how to help the streets department at Thursday’s village council meeting. BLANCHESTER — An earnings tax to help the streets department took center stage at Thursday’s Blanchester Village Council meeting. Mayor John Carman, the council, and streets department supervisor Wayne Clifton brought up the possibility of a one percent earnings tax on the November ballot that would be solely for helping the streets department. This would be the eighth attempt at a tax on the ballot if they decide to put one on. Hopkins expressed the sentiment again after Village Solicitor Andrew McCoy reminded them Aug. 7 was the deadline for local issues to be placed on the ballot. Carman noted they would have to be very specific with what the money was going toward. He believes the more specific they are, the more citizens will be willing to support it. If they don’t, then Blanchester may become a “quilt city”, as he called it, due to patchwork that would need to be done for the streets. Hopkins said the only reason he would vote for it is if the tax is only for the streets department. Some citizens attending the meeting expressed uncertainty of it passing, given how previous taxes and levies failed on the ballot. Carman stood by his point that if, they are specific, it may get get citizens’ support. McCoy said he’ll start working on something to present to council soon. • Clifton told the council he was upset at the closing of Save-A-Lot. Carman told him the business owner spoke to him, saying they were closing due to lack of business in the area and there was nothing that could be done. 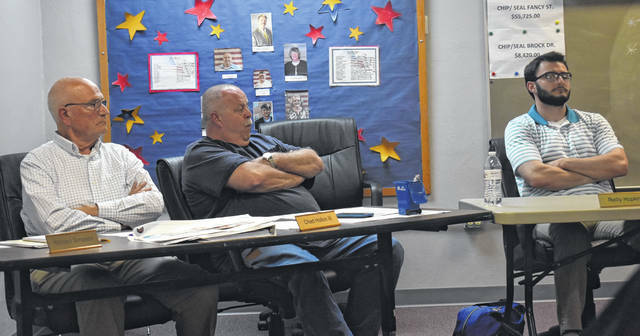 • The council discussed trading off meeting locations with the Blanchester American Legion. The Legion would host their meetings in the room where council usually meets and the council would meet in the upstairs.